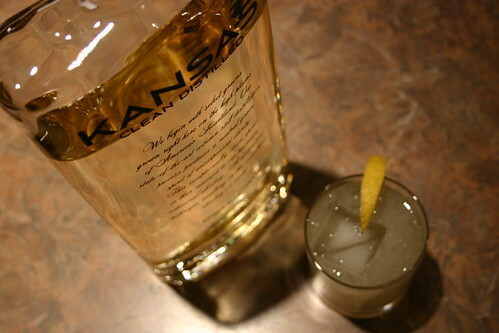 Kansas Clean Distilled Whiskey, or simply Kansas for short, is “a new whiskey for new whiskey drinkers”. Their process starts with artisanal whiskey and column distilled winter wheat spirit. These are blended to make a very light and tremendously smooth whiskey. But is whiskey really the right word. Yeah, I’d say so. A couple years ago I might have been willing to get up on my soapbox and spout off about how this isn’t true whiskey and blah, blah, blah. But you know, maybe I’ve mellowed a bit, or maybe my ideas have simply changed. Thing is, a few years back I could have said similar words about the new gins coming on the market. Words like, “they’re wussing up the gin”, “where’s that familiar juniper punch”, etc. Over those years though, the gins I would have been criticizing are now some of my favorites and gins now completely run the spectrum. So, what’s Kansas taste like? It’s smooth and very mild. The color is very light parchment (think ivory resume paper). The nose is light with aromas of vanilla and light spices central. The flavor follows the nose every step of the way. The vanilla notes are central with super light hints of spice coming through. Overall you get the core flavors of whiskey in a very light, mellow package. I wanted to try this whiskey in a cocktail so I mixed up one of my favorites, a classic whiskey sour. I dropped the bitters to almost nothing, trying to let the flavors of this whiskey come through, if only lightly. And that they were. I used one dash of my Hess’ House Bitters. The vanilla of the whiskey came through lightly in the background but the bitters, albeit a small amount, added most of the spice flavors. The drink was tasty, but lacked the whiskey flavors that I feel are key to the overall profile. So here’s my honest truth. I’m a whiskey guy and this isn’t the whiskey for me. It’s too light. When I pour a glass of whiskey or mix it into a cocktail I do it because I want to taste it. Where I see Kansas coming in is as a gateway whiskey for people who want to start drinking whiskey, but want to start slow. Start with this, you’ll get the base flavors in a delicious package and once you’re comfortable you can move to the next level. Maybe an Irish Whiskey or a blended scotch.